In the beginning, there existed two deities known as Uranus and Gaia. They gave birth to the Titans (a race of powerful beings). Saturn, Titan of time, set reality in motion. Ultimately, time yielded the existence of the sky, the sea, and the end of life—death. To rule these notions, Saturn had three sons: Jupiter (sky), Neptune (sea), and Pluto (underworld). The son’s of Saturn were not Titans, but a race of seemingly less powerful deities known the world over as the Gods. Fearful that his sons would overthrow him, Saturn devoured them and imprisoned them in his stomach. This caused a great war between the Titans and Gods. Ultimately, the Gods won and Jupiter took the throne as leader of the Gods. The examples in this section make extensive use of a toy graph distributed with Titan called The Graph of the Gods. This graph is diagrammed below. 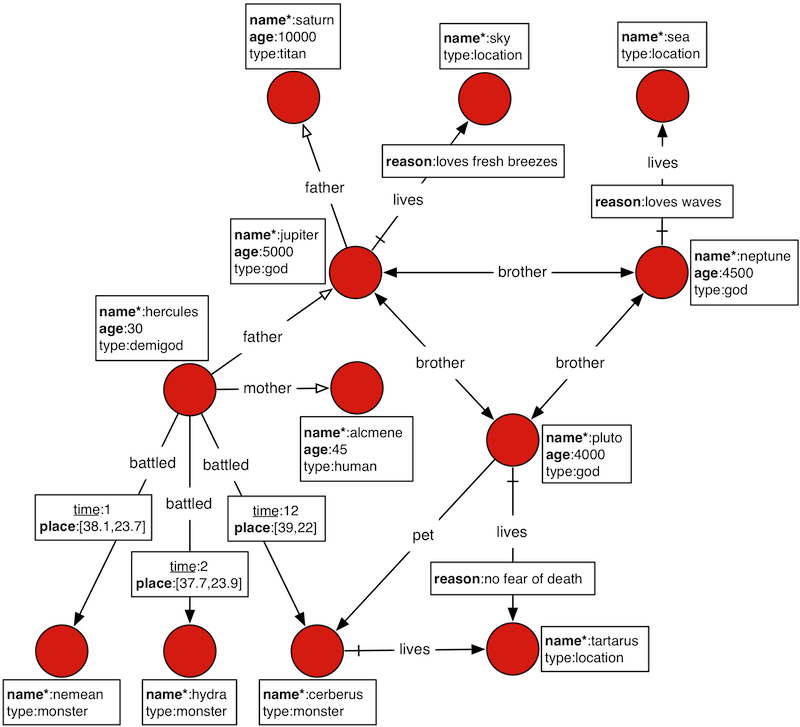 The abstract data model is known as a Property Graph Model and this particular instance describes the relationships between the beings and places of the Roman pantheon. Moreover, special text and symbol modifiers in the diagram (e.g. bold, underline, etc.) denote different schematics/typings in the graph. Unbeknownst to the Gods, there still lived one Titan. This Titan can not be seen, has no name, and is only apparent in the fact that reality exists. Upon the shoulders of this lost Titan, all of reality hangs together in an undulating web of relations. Titan can be downloaded from the Downloads section of the project repository. Once retrieved and unpacked, a Gremlin console can be opened. The Gremlin REPL (i.e. interactive shell) is distributed with Titan and only differs from the standard Gremlin console insofar that Titan is a pre-installed and pre-loaded package. Alternatively, a user may choose to install and activate Titan in an existing Gremlin console by downloading the Titan package from the central repository. In the example below, titan.zip is used, however, be sure to unzip the zip-file that was downloaded. Titan requires Java 8 (Standard Edition). Oracle Java 8 is recommended. Titan’s shell scripts expect that the $JAVA_HOME environment variable points to the directory where JRE or JDK is installed. Note, that this tutorial assumes the activation of the tinkerpop.sugar package for more concise syntax. Please refer to the Tinkerpop documentation for more information on package handling. The Gremlin terminal is a Groovy shell. Groovy is a superset of Java that has various shorthand notations that make interactive programming easier. Likewise Gremlin is a superset of Groovy with various shorthand notations that make graph traversals easy. The basic examples below demonstrate handling numbers, strings, and maps. The remainder of the tutorial will discuss graph-specific constructs. gremlin> "Titan:" + " The Rise of Big Graph Data"
Refer to Tinkerpop documentation, GremlinDocs and SQL2Gremlin for more information about using Gremlin. The example below will open a Titan graph instance and load The Graph of the Gods dataset diagrammed above. TitanFactory provides a set of static open methods, each of which takes a configuration as its argument and returns a graph instance. This tutorial calls one of these open methods on a configuration that uses the BerkeleyDB storage backend and the Elasticsearch index backend, then loads The Graph of the Gods using the helper class GraphOfTheGodsFactory. This section skips over the configuration details, but additional information about storage backends, index backends, and their configuration are available in Part III, “Storage Backends”, Part IV, “Index Backends”, and Chapter 12, Configuration Reference. For those using Titan/Cassandra (or Titan/HBase), be sure to make use of conf/titan-cassandra-es.properties (or conf/titan-hbase-es.properties) and GraphOfTheGodsFactory.load(). The property place is also in a graph index. The property place is an edge property. Therefore, Titan can index edges in a graph index. It is possible to query The Graph of the Gods for all events that have happened within 50 kilometers of Athens (latitude:37.97 and long:23.72). Then, given that information, which vertices were involved in those events. Graph indices are one type of index structure in Titan. Graph indices are automatically chosen by Titan to answer which ask for all vertices (g.V) or all edges (g.E) that satisfy one or multiple constraints (e.g. has or interval). The second aspect of indexing in Titan is known as vertex-centric indices. Vertex-centric indices are utilized to speed up traversals inside the graph. Vertex-centric indices are described later. The edge property time on battled edges is indexed by the vertex-centric indices of a vertex. Retrieving battled edges incident to Hercules according to a constraint/filter on time is faster than doing a linear scan of all edges and filtering (typically O(log n), where n is the number incident edges). Titan is intelligent enough to use vertex-centric indices when available. A toString() of a Gremlin expression shows a decomposition into individual steps.